Lightning Systems, a Colorado-based developer of zero-emissions drivetrains for commercial fleets, has received an executive order from the California Air Resources Board (CARB) for the zero-emissions Lightning Electric model. 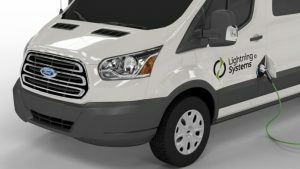 Lightning Electric is a battery-electric drivetrain package for the Ford Transit 350HD, a product used extensively by commercial and government fleets. Lightning Systems tested the product under the newly released 2018 CARB efficiency and range validation test procedures for medium-duty vehicles. The testing was performed at the SGS Environmental Testing Center in Aurora, Colo., and guided by the engine certification team at ECO Inc. Results demonstrated that the Ford Transit 350HD equipped with the zero-emissions Lightning Electric drivetrain achieved 61 MPGe on EPA City routes and 66 MPGe on EPA Highway routes, compared to 13 MPG and 15 MPG, respectively, for the identically configured gasoline Ford Transit 350HD. The 50-mile range system was rated at 54 miles all-electric range, and the 100-mile range vehicle came in at exactly double at 109 miles all-electric range, says XL. Lightning Electric for the Ford Transit is offered throughout the U.S. as part of Ford’s eQVM program. The product is available for Ford Transits with a 10,360-pound gross vehicle weight rating. Ford’s vehicle warranty covers the base chassis for vehicles with the Lightning drivetrain, and Ford QVM dealers and upfitters perform installations and service. In California, the first Lightning Electric vehicles will be deployed by XPO Sales Inc. for the LAX Wingate Hotel in Los Angeles.